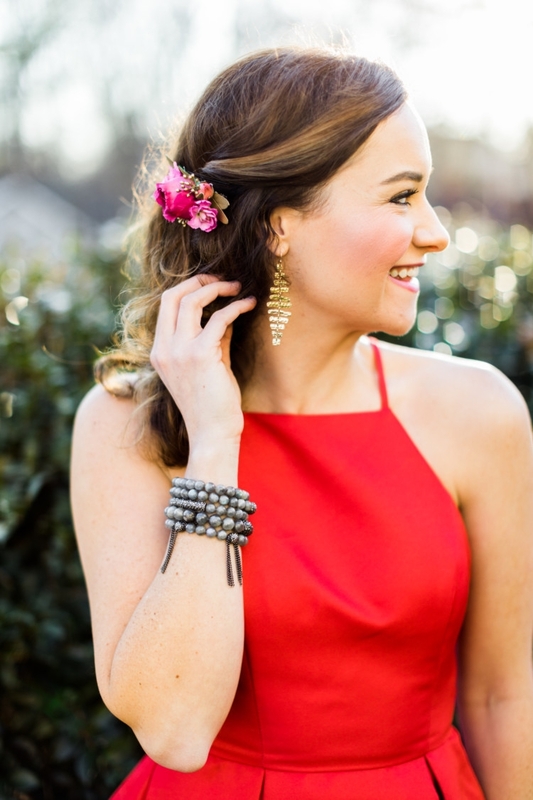 Thank you to Fisher’s Finery and ReCORE Fitness for partnering with me on this post! 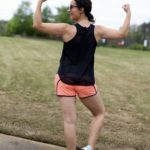 Like many other mamas out there, I found out I have Diastasis Recti after having Finn. 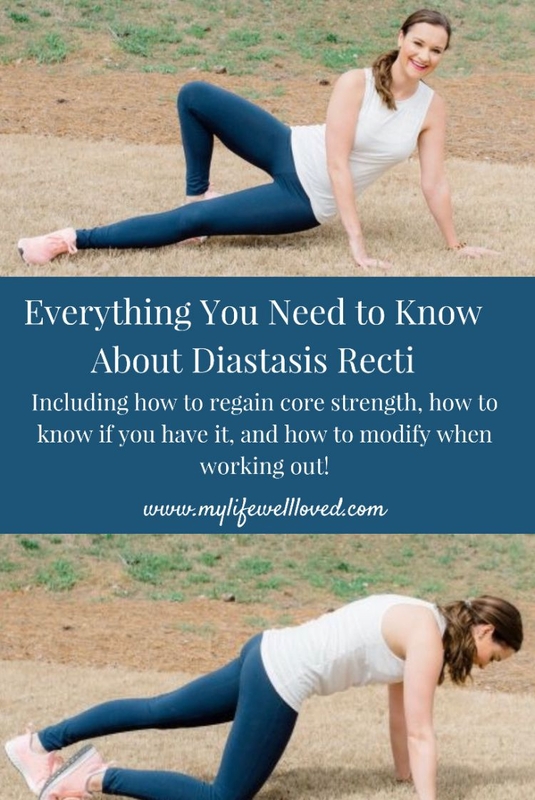 So many of you have come to me with questions about how to fix Diastasis Recti, how to workout, how to regain strength in your core, and what modifications are best for Diastasis Recti. I knew I didn’t have all the answers, as this is all still very new to me too, so I found a professional who is going to give us all the info we need today! 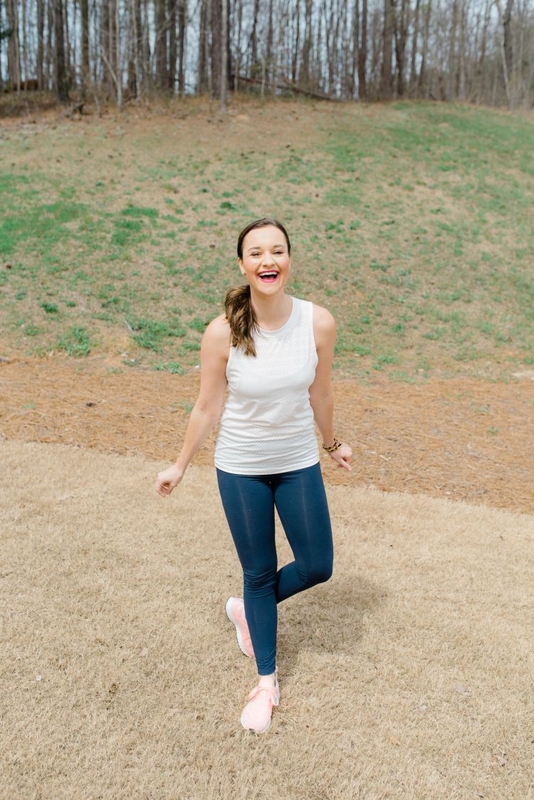 As we start Week 3 in our Core Challenge, I encourage you to go back and alternate between Week 1’s Workout and Week 2’s Workout using the modifications suggested throughout this blog post! My personal trainer from Homefit had me do lots of functional fitness before he began implementing straight up ab exercises. We did lots of mountain climbers, shoulder taps, plank jacks, kettlebell sumo squats, kettlebell deadlifts, and dumbbell thrusters to start to regain my core strength. As you will notice, I am wearing my new Fisher’s Finery Navy Yoga navy blue Leggings! I LOVE these as they are the perfect amount of compression + comfiness! They are super affordable and I enjoy having something different than the usual black. However, these do come in black, 2 shades of grey, and white too if you prefer that! These leggings are currently on sale for $31 + free shipping! PS – be sure you tune into stories tonight (3/18) to see my Mom-Friendly Swimsuit Try-On + a giveaway for a gift card to buy your own swimsuits this season! 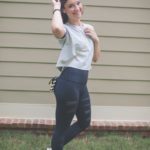 Shop my $31 Leggings from Fisher’s Finery! Now onto our Diastasis Recti Professional! Celeste Goodson, ACE Medical Exercise Specialist and owner of ReCORE Fitness has worked in health and fitness settings for over 15 years; including physical therapy clinics and cardiac rehab. 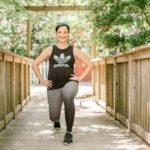 She has worked exclusively with pre and post natal women the last 9 years, including professional runners, olympic athletes, singers, and moms of multiples. Read her personal recovery story here. Celeste realized specific core reconditioning can benefit women postpartum and help reduce issues from Diastasis Recti, low back pain, pelvic floor weakness, prolapse, hip instability, posture issues etc. Celeste has developed the ReCORE program, a 6 week core reconditioning program. Celeste also developed the FITsplint (Maternity and Post-Natal) to help women support and/or splint their core when needed. 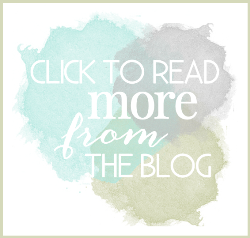 Celeste believes that while pregnancy is a natural and amazing process, the muscles and ligaments have been stretched, strained and weakened and should be reconditioned. It’s recommended to stay away from crunches, sit ups and forceful (weighted) twisting exercises while reconditioning the inner core and working with DR since they are higher pressure core exercises and difficult to do well until DR is functional. I don’t like to say never do again because women can do them correctly after regaining core control. They just aren’t my favorite and there are many other ways to work the all the abdominal muscles in more functional moves like moving plank variations (once DR is functional) TRX, and, hanging leg raise, pallof press exercises, gym ball roll outs etc. During pregnancy, women want to be aware of “doming” and putting excess pressure on pelvic floor. Doming is when the vertical line down the center of the abs may budge during exercise. This means, either the mom didn’t engage the core well or the core isn’t strong enough to control pressure. If you can’t do the exercise without bulging, don’t do it. It is estimated that over 90% of women will have some degree of Diastasis Recti after 36 weeks due to a growing belly and other factors we can’t control. However some research has shown that core/pelvic floor strengthening exercises improve weakness and dysfunction issues in Diastasis Recti, stress incontinence and pain, so women can possibly lessen the degree of DR with core control. Keeping the core strong will also help in recovery. Learn Ab Sets (see here) and learn to engage your inner core on the hard part of an exercise. 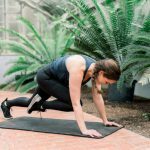 What pure Barre (classic) exercises should be avoided while closing DR? @dapiceem. It’s more about how you do the exercises. Learn core control and as you slowly increase inner/outer core strength, you will be able to do more exercises with core control! See IG account and youtube for some exercise ideas, this balloon test is a great tool to help with core control. Yes, but it is more about how the planks are done. Side planks are great throughout the entire pregnancy. Front planks will be more difficult to do in the 3rd trimester as it will require more core control and strength to perform without the “doming” down the midline of the abs. If you are talking about the shape of the waist, that’s really determined by the width of the hips in relation to the width of the chest. This is determined by bone structure and can’t be changed through exercise and diet. Cleaner eating is the best way to reduce body/belly fat and exercise is the only way to gain strength. All ab muscles should be strengthened, internal/external obliques, rectus abs and transverse abs. Start working on inner core (pelvic floor and transverse ab) exercises and learn how to control the core. Learn basic Ab Sets (see here) Learning diaphragmatic breathing goes with this as well. Then do an ab set or engage the core on the hard part of an exercise. Then learn to implement that with other exercises. Our Youtube channel also lists several other to work on. Great question. There are many factors that involve “healing”. Genetics does play a part in how well tissue can tighten, but no matter how long postpartum, women can get DR functional with or without it closing. From my personal experience helping women with DR for over 9 years, many women will not be able to “close” their DR, but some will.Many can improve it with corrective exercise and strengthening. Instead of focusing on the width, I try to get women to focus on the function. The overall goal should be to get it functional no matter what, even if they want surgery. Once functional, women can move on to harder exercises even if they have functional DR. Most women don’t need surgery to regain core strength and function after DR. Exercise will not help with stretch marks or loose skin. See our youtube video, “how to check for DR” This will give you a good idea. But don’t freak out, it is pretty normal to have some separation postpartum. Technically 1-3 finger widths is considered abdominal separation (stretching) and 3 or more finger widths is considered Diastasis Recti. Hernias make it a little more challenging for tissue to tighten but improvements can be made. Either way… the progression of exercises is the same with ReCORE. It is important to regain core control and strength so hernias do not become a problem or painful. What are the exercises that you need to avoid? 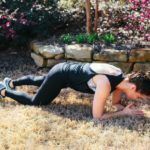 @bamaworkingmom It is best to regain core control (learn how to do core exercises without the belly bulging) and not hold your breath while lifting. Which exercises to stay away from will depend on how strong the core is (if you can do it without bulging) and will vary with each person and strength improves. Start with Ab Sets and dead bugs, but remember it matters how you do them. Learn breathing and form. Doing them with a bulging belly is not going to help you regain inner core control and strength. Specific exercises during pregnancy will vary by individual strength, again watch for the belly bulge. This video will show a few specific things to avoid doing while pregnant. See an experienced pelvic physical therapist in person or certified pre & post natal trainer. pelvicguru.com has a directory. There is definitely hope! Just need to regain inner core strength and get DR functional so you can start doing more exercises. Feel free to check out our ReCORE program options. It is possible it may increase a little. There are many factors that influence it such as: carrying mulitiples, the way the baby carries (high, low, straight out) etc. 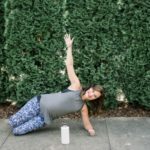 The only thing we can control is keeping the core strong during and after pregnancy. If a program sells promises such as “prevent DR with these exercises”…run. They are selling snake oil. Thank you so much for coming over to MLWL and sharing your knowledge with us, Celeste! She has offered my followers a 10% off coupon for ReCORE 6 week program with code MLWL10. What have you guys been doing to rehab your diastasis recti? I’d love to hear what ab exercises you’ve been doing below! 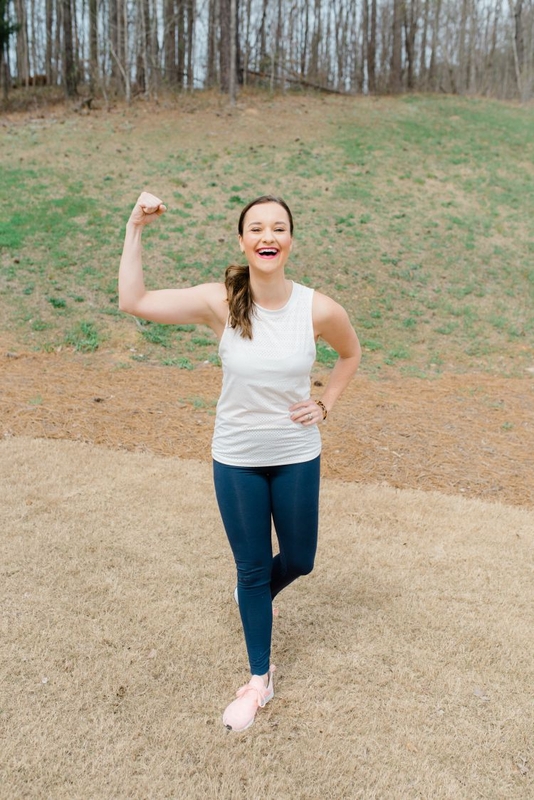 SHOP the Diastasis Recti Post HERE! Pin the Diastasis Recti Post for Later! I think this is really helpful information. 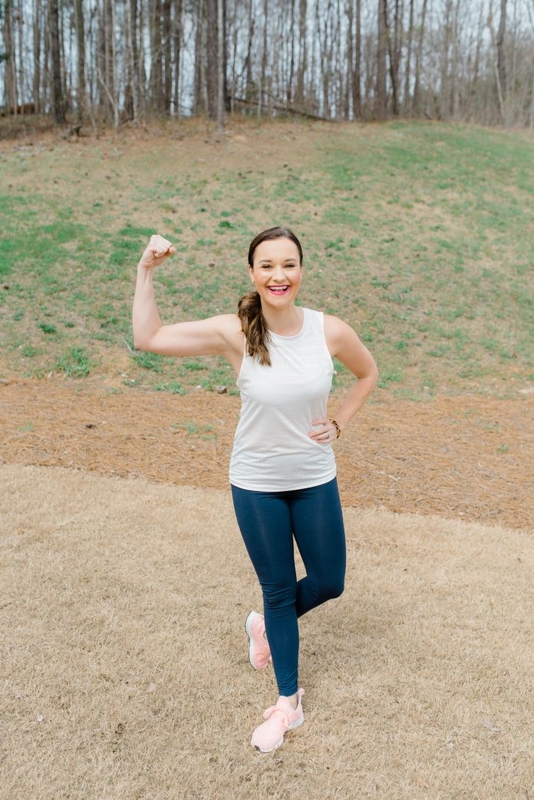 I would also encourage you to refer others to a pelvic floor physiotherapist and to consult with a certified postpartum coach, like Brianna Battles (she is also on IG).